Charter catamaran Altitude Adjustment has a last minute discount due to a cancellation. $500 discount for 7-night charter in the Virgin Islands between April 8-19, 2019. Altitude Adjustment is a 44-foot Lagoon catamaran with one crew. This catamaran is fully air conditioned and accommodates up to 6 guests in 3 double cabins, each with ensuite head/shower (electric-flush toilets). The captain is also the cook and provides breakfast & lunch but requires guests to have 3 dinners ashore at client expense. Amenities include an 11-foot dinghy with 9.9HP motor, 2-person kayak, 2 standup paddleboards (SUPs), snorkel gear, floating mats, iPod dock, hammock, etc. Altitude Adjustment has an elevated steering station that frees up space in the cockpit and an additional sitting area located behind the trampolines. Brian is a polymath; his expertise is wide-ranging. On board Altitude Adjustment he wears all the hats. Brian says, “I do everything on board; captain, cook, bartender, maid, plumber, engineer and diesel mechanic. I take care of everything, except musical entertainment, as unfortunately I can’t sing.” Not only does he do everything, he does it all extremely well. And, what Brian lacks in musical aptitude, he overwhelmingly compensates for in warmth, charm and humor. 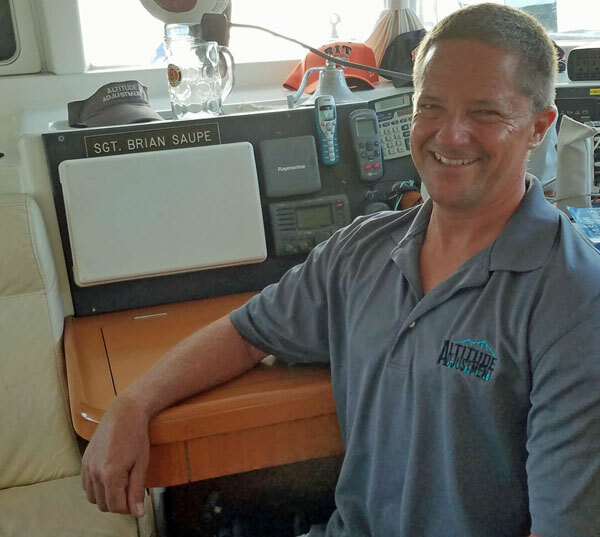 Brian grew up spending all his time on the ocean off Long Beach, California. In addition to swimming, surfing, fishing, and sailing, he played water polo, was a competitive swimmer, and a summer lifeguard. He taught sailing in the Boy Scouts. (He’s an Eagle Scout, only 4% of Boy Scouts are granted this rank). He is always available to help those who have little experience in the water. 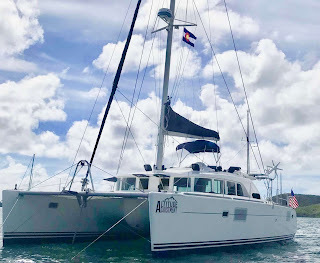 Guests aboard Altitude Adjustment keen to try snorkeling, paddle boarding, or taking a turn at the helm, will delight in his gentle, patient instruction.